Hi everyone! It’s time for The Alley Way Stamps March release blog hop! The new stamps are awesome. There are THREE new sets and ONE mini set in this release! The hop begins on Angel’s blog and if you have been hopping along, you should have come from Emily’s blog. Make sure you hop around to all of the blogs featured in the link list at the bottom of this post. You will find lots of inspiration! Today, I’m showcasing the *NEW* Yappy stamp set! The word "Party" was cut with my Silhouette (you can find Maelle K's fonts HERE). I did the watercolor background with Distress inks. There are PLENTY of different ways to win! You can pick and choose which ones you want to do. But the more ways you choose, the more chances you have to win! One way is to enter the Rafflecopter on the TAWS blog. For our friends that are not on social media, you can join in too and comment on the TAWS blog – we will randomly pick from either the Rafflecopter participants or commenters! Another way to win the new sets is to comment along this blog hop. So be sure to check out the TAWS blog for all the details. This runs today only (February 28th, 2015 – TAWS time)! Now just leave a comment below and hop over to Heather’s blog! If you get lost anywhere along the way or encounter any broken links, here is a list of all the hop participants! Such a cute card - love the watercolors and the bold script. I love the watercolor background! And the sentiment! The design is awesome really love it. Love the watercolor background. Just beautiful. Love the colors and the watercolor background - really well done and I love the sentiment - YOU are so cool and such a great stamper!!! Love the colors on this festive party card. So super fun! Love it! What a fun and happy card. Love the bright watercolor against the black. This is beautiful! Would love a video on how you make these awesome backgrounds! What a super fun background! Love the bold sentiment and the little sequins are the perfect finishing touch! Awesome card! I love how your black sentiment pops against your distressed background! Thanks so much for playing along with us this week at ATCAS! Gorgeous background...love the black sentiment. Francine, I knew I wouldn't have time today to hop to see all the cards, but I also knew that I just had to see yours. Your watercolor background is amazing! I super love this! Ta carte est magnifique ! J'aime le rendu de toutes ces couleurs !!! Bravo ma belle ! Wow what a fabulous backdrop of colours Francine! Thanks so much for joining us ! A fabulous card Francine, a brilliant watercolouring of the background and a lovely sentiment and using the sequins!! 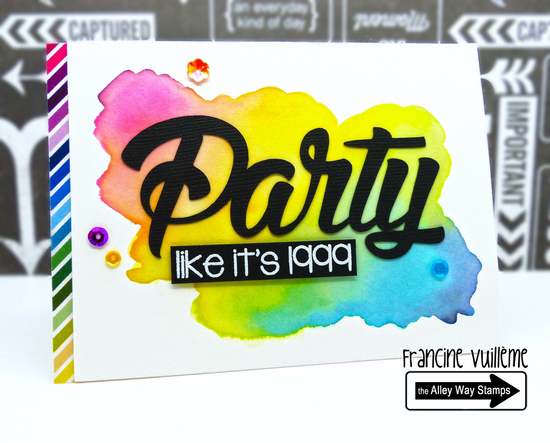 Gorgeous watercolour background and love your cut sentiment Francine! You are so talented and I'm simply swooning over this. A fantastic card, I love it. Gorgeous colors and I love that rainbow color strip alongside :) Thank you for sharing with ATCAS!